This part is a new, reproduction C4 to C6 Satin Black Machined 18×8.5 Wheel (C7 Stingray Style) which can be installed on a 1988 to 2013 Corvette. The finish on this wheel is achieved through several different phases. The finishing process begins with a Satin Black powder coat applied to the wheel. The face of the wheel is then precision machined using a coolant and ceramic bit. 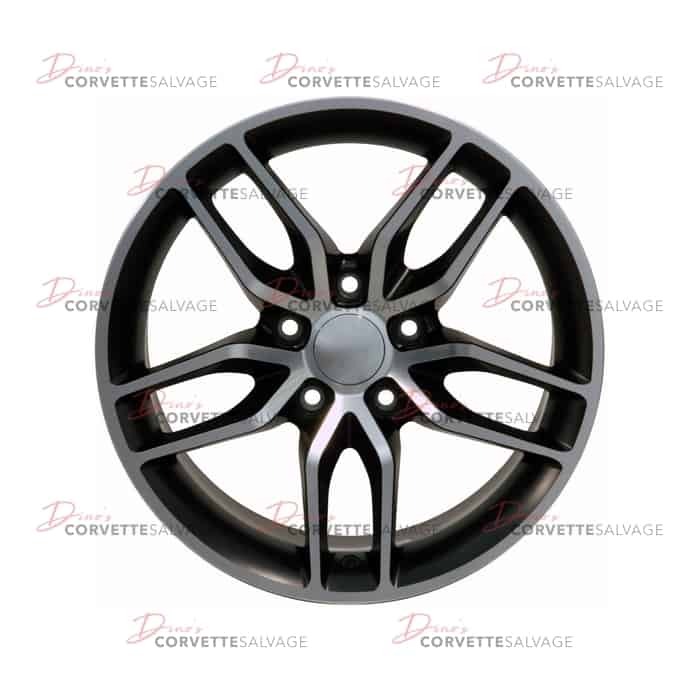 This method leaves the Satin Black powder coat in the recessed areas between the spokes while creating a fine machined aluminum appearance on the face of the wheel. The final stage consists of two layers of clear coat, giving this wheel a beautiful and unique look. This wheel is not affiliated with General Motors Corporation in any way or form. The terms "Corvette" and "C4, C5, C6, C7, Grand Sport, Stingray, Z06, ZR-1" are used for fitment and descriptive purposes only. Dino's Corvette Salvage, LLC states that our use of the General Motors Corporation trademarked terms in our product descriptions constitute fair use and nominative use and is in no way to offer confusion that Dino's Corvette Salvage products and General Motors products are related or their companies. We guarantee this wheel against all manufacturer's defects for one full year. We also provide a lifetime structural warranty and a one year warranty on the finish, providing the wheel has been properly maintained. All of our wheels are TUV, JWL, VIA, SAE or DOT approved and guaranteed to be straight and true. See below for complete warranty details. To the fullest extent recognized by the laws of the state where the wheel was purchased, Dino's Corvette Salvage issues this limited warranty to define the rights of the purchaser, and limit Dino's Corvette Salvage, with regard to warranty claims. Dino's Corvette Salvage warrants that our wheels will be free from structural failure under normal and intended use for as long as the original retail purchaser owns the product. Warranties are valid only for listed fitment applications. Installation must be performed by a certified technician and follow WTC Aftermarket Wheel Installation Guidelines. Failure to comply with these instructions shall void this warranty. Dino's Corvette Salvage, LLC warrants that the face finish of wheels will be free from defects in material and workmanship under normal intended use for a period of one year from retail purchase. In no event shall Dino's Corvette Salvage, LLC be liable for any special, incidental or consequential damages. Dino's Corvette Salvage products are not designed to be used with any accessories or adapters other than those supplied and/or approved in writing by Dino's Corvette Salvage. To initiate a warranty claim, the purchaser shall return the wheel for visual inspection; along with a copy of the original sales receipt. Upon determination that the wheel has failed to perform as expected under this warranty, the wheel will be replaced at the sole and absolute discretion of Dino's Corvette Salvage. Warranty replacement covers the wheel only. Purchaser is responsible for all costs associated with dismounting, mounting, balancing, reinstallation and shipping.